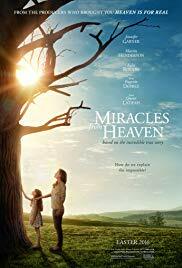 Plot: MIRACLES FROM HEAVEN is based on the incredible true story of the Beam family. When Christy (Jennifer Garner) discovers her 10-year-old daughter Anna (Kylie Rogers) has a rare, incurable ... Starring: Jennifer Garner, Kylie Rogers, Martin Henderson, Brighton Sharbino. distributed by TriStar «Miracles from Heaven» in the US movie theaters released on March 18, 2016 and has grossed over $74 million worldwide; dvd and blu-ray release date was set for July 12, 2016. Rent from Netflix and Redbox from July 12, 2016. «Miracles from Heaven» in the UK released in movie theaters on June 10, 2016. The movie released on dvd and blu-ray on October 17, 2016.